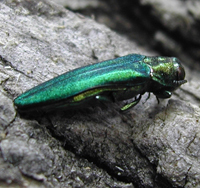 EAB, Agrilus planipennis Fairmaire (Coleoptera: Buprestidae), is identified as the causative agent in ash tree mortality and decline. No bigger than a penny, this green menace has wreaked havoc on millions of ash trees in the Midwest and if not controlled it could wipe out the ash tree species in North America. The adult beetles nibble on ash foliage but cause little damage. The larvae (the immature stage) feed on the inner bark or cambium layer which is the crucial layer between the bark and wood of ash trees, disrupting the tree’s ability to transport water and nutrients. Emerald ash borer probably arrived in the United States on solid wood packing material carried in cargo ships or airplanes originating in its native Asia. ~It attacks only ash trees (Fraxiinus spp.). This DOES NOT include Mountain Ash. ~Adult Beetles are metallic green and about 1/2 inch long. ~Adults leave a D-shaped exit hole in the bark when they emerge in Spring. ~Woodpeckers like EAB larvae; heavy woodpecker damage on ash trees may be a sign of infestation. ~Firewood cannot be moved outside of the state and/quarantined areas because of federal/state EAB quarantines (http://datcpservices.wisconsin.gov/eab/article.jsp?topicid=23). How Do I Know If My Tree Has EAB? Is Your Ash Tree Worth Treating? YouTube video on soil drench applications.